Rangers manager Steven Gerrard argued that Craig Levein got his arithmetic wrong when the Hearts manager claimed his team were up against 13 men on Sunday. READ MORE - How many of Rangers’ seven red cards this season have been deserved? 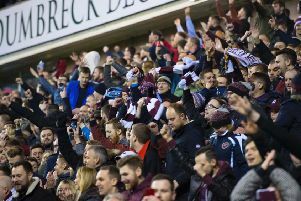 Levein felt referee Bobby Madden and his assistant cost his side when there was no offside flag raised as Alfredo Morelos netted in Rangers’ 2-1 Tynecastle win. The Jambos boss also claimed the Colombian should have been sent off for a series of fouls. Gerrard said: “Craig’s entitled to his opinion, like I am when I speak about Hearts or Aberdeen or whoever it may be. “I saw the interview when he said they were playing against 13 men. The only mistake I saw in the interview was that it was 14, because our fans were superb on the day.